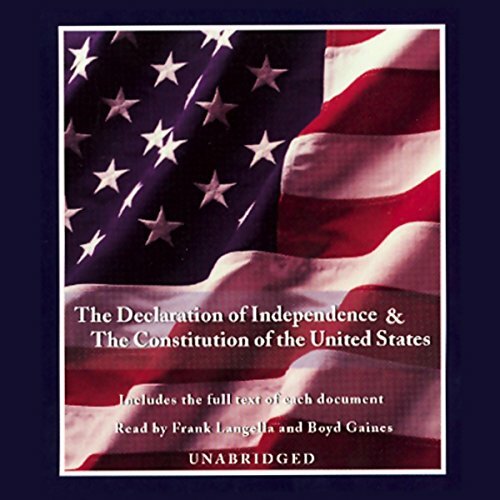 Here are the two most treasured documents of American freedom together on one audiobook. Drafted by Thomas Jefferson in 1776 as an act of rebellion, the Declaration of Independence powerfully expresses the political principles of an emerging nation. As justification for severing ties with England, The Declaration presented a list of grievances against the king and declared the colonies to be sovereign states. Ratified in 1788, the Constitution for the United States of America remains a shining example of patriotism and compromise. In outlining the power of the three branches of government and establishing the rights of all Americans, the Constitution united the 13 independent states and set forth the official viewpoint of a newly unified nation. Its most significant and insightful feature is that it can always be amended. (P)2007 Random House, Inc. Random House Audio, a division of Random House, Inc. I really enjoyed the narration and it is ads to the enjoyment. I bought this not just to refresh my memory but to to ingrain some of our most important documents into me. The way this was read and the voice used made this very easy to understand and enjoyable to listen to. Reads like Vogon poetry and it’s wonderful because of it! An architectural dream of perfection and play. Great way to "read" the Declaration of Independence and the Constitution of the United States. Something to refer to often to learn and keep fresh in mind the construct of our government and our rights that our government should be protecting. Well read. Amendments 11-27 not included. Would have preferred all amendments be included. Otherwise, very well read. One of the most relevant documents in world history.